At this point in your life you might have heard of more than one adorable couple who met through the dozens of dating sites and apps out there. You might also be thinking, is online dating for me? Luckily, each dating site and app has been tried and tested and based on stats you’ll be able to work out which site suits your needs best. 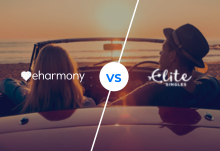 We’ve taken two of the most popular sites, Match.com and EliteSingles to compete against each other in a ‘dating site showdown’ to decide which of the two wins the battle and comes out on top. After a few years trying out free dating apps you might decide enough is enough, and both Match.com and EliteSingles are natural choices for the next stage of your online dating journey. Both are well-established and trustworthy dating sites. They’ve had years of experience matching Australian singles under their belt. 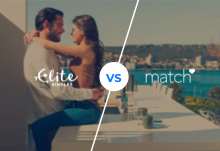 Match.com has been helping Australians find love since 2003 and EliteSingles has a strong following in Australia and around the world with over 13 million members. They are both excellent dating apps for finding love, but when push comes to shove, which site is really better? Much the same to other dating apps, both Match.com and EliteSingles are free to sign up for a basic membership, however it’s clear to really get the most out either sites, you’ll need to join their paid membership options. Match.com offer an attractive option of 3 month membership at $34.99 per month, however the ‘best value’ 3 month membership opens up some additional features like ‘profile highlight’ and costs $37.99. If you want to take the plunge and sign up for 6 months, the price goes down further 6 month at $26.99, or $27.99 if you chose the ‘best value’ option, which offers some additional features. Another great perk from Match.com, is the free 7-day trial for new users. It’s a great way to decide whether to take the plunge and pay for the membership. EliteSingles, on the other hand has a slightly more expensive pricing plan with the 3-month membership coming in at $89.95 per month. If you’ve decided you want to join for 6 months, it comes out cheaper at $54.95. Match.com has a simple and relatively quick signup process. You’re immediately asked for your age, gender, and then the age range and gender of members you’re looking to meet. The site then walks you through the step-by-step process of registration including a detailed matching-process questionnaire. Most dating sites do require you to fill out some form of questionnaire to help with the matching process. Match.com covers questions about your potential match, including physical features, religious beliefs and certain deal breakers like smoking or drinking habits. The next stage in the process is to fill out information about yourself including the option to write a short bio. The last stage is to add a photo of yourself; you’ll then need to wait to get approval from the moderators but once it’s approved you’ll be sent your first matches. EliteSingles has a similar signup process, however it’s suggested that users only sign up from the desktop version since the app doesn’t seem to sync new users very well. Similar to Match.com you’ll first pick your gender and the gender/s you’ll want to be matched with. From there you’ll be taken to a personality questionnaire that analyzes over 29 character traits. Make sure you have some time on your hands because the test can take up to 45 minutes to fill out. The questions range from anything as basic as your education, to adjectives you’d use to describe yourself. Some might be put off by the lengthy questionnaire but once it’s finished the site does the matching work for you, and the more information it has, the better the quality of matches. Match.com has a clear and concise interface, with simple features and functionality. What’s also great about Match.com is that it doesn’t intimidate by being overly technical – member profiles aren’t overwhelming, and show only the basic details members want others to see. The entire site is setup to encourage members to communicate with one another, including easy-to-use tools and a live chat bar so you can chat to members in real time. EliteSingles doesn’t come in too far behind, with a simple and clear interface. Once you’ve got through the grueling questionnaire, the site auto-fills your information following the signup process. The only downfall is the desktop versus app issue. The signup process only really works using a desktop and you’ll be able to view more features as opposed to the app which has considerably less. This is disappointing and inconvenient for those who are always on the go, especially if you only use a desktop at work. Match.com is a clear winner in this category. EliteSingles boosts an expert matchmaking system, once members have filled out the extensive questionnaire, the site uses a data-driven process to make matches. You're offered a maximum of 30 matches a day, but in reality, members are offered 7 to 10 matches. The idea behind this, is to steer away from the ‘one-night-stand’ style apps and sites, and to put more emphasis on encouraging serious relationships between members. Despite this, some members might find the number of daily matches limiting. 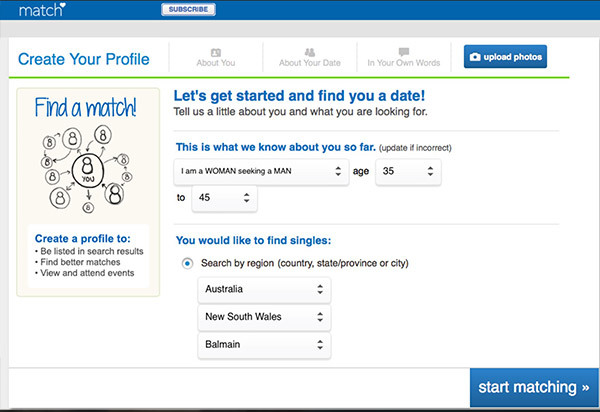 Match.com also utilize a data-driven matching algorithm which is based on the questionnaire you initially fill out, but also on user-feedback and behaviour. This means your matching outlook improves the more a member users the site. The site intuitively learns who you are and how to better match you each time you use the site. Match.com win in this respect as their matching system is far more sophisticated. EliteSingles is set up to encourage a lasting relationship between members and the features are setup to enable this. It has a private messaging inbox where you can send ‘winks’ and ‘likes’ directly to other members inbox. There’s also a way to ask ‘customized’ questions in inspire further communication. In addition there’s a hot/or not section which where if a user is interested they must send a message- another great way to encourage additional communication. Match.com also encourages communication via instant messenger where you can also send ‘winks’ and ‘likes.’ Match.com has a great search features where you can ‘reverse search,’ and check out members that are searching for you, or ‘Mutual search’ where you’ll be both searching for each other. EliteSingles wins this round due to its excellent communication features. Match.com takes appropriate security measures to help protect your personal information. This includes using encrypted usernames, passwords, and other personal data. The site also screens all profiles before activating them. EliteSingles protects and encrypts all personal information including credit card details and firewalls are used to protect user information. There’s also the option to report any potential abuse from users. Both sites are great options for online dating and use a sophisticated matching system, however in this particular race, Match.com is the winner based on its ease of use. In our current climate, as we move closer to a completely mobile climate, EliteSingles need to modernise its app to offer the same features and filter options available on desktop.